Villa Tobler Lutzenberg - villa-toblers Webseite! Villa tobler - Your new home? 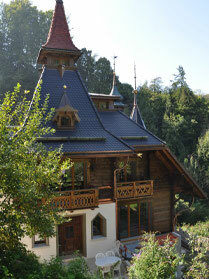 This historical villa is named after Fritz Tobler (1868-1929), an industrialist in the embroidery business. He had the house built for him 1904 in Teufen AR by the famous architect Jaques Gros, who is best known for designing the Grand Hotel Dolder in Zürich. The villa, once well known in Teufen, regrettably had to give way in the year 2002 to a newly built housing complex. Luckily family Brandenberger spotted it before it could be demolished 2006. They started a large-scale project and saved the upper two floors, storing them until they could be reconstructed. Miraculously family Brandenberger had bought an old spinning mill in Lutzenberg in 2002. This place seemed perfect for the villa. 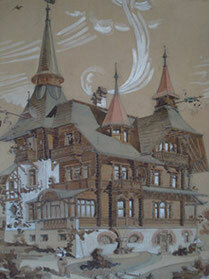 After a long planning phase they were granted permission end of 2007 to rebuild the Villa Tobler.